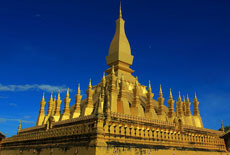 .On this Laos tour , you will get a panoramic view of the beautiful scenery and long history of Laos. Ancient temples, architectural monuments, ancient cities, villages, natural sites of beauty, all tell beautiful stories of Laos and its people. The quiet and charming capital Vientiane with its many architectural masterpieces, VangVieng, a small town nestled on the banks of Nam Song River and a landscape of plains, mountain peaks and calm rivers, LuangPrabang, and its sleepy environment surrounded by steep mountains and natural wonders are all destinations on this incredible trip. This trip promises to be unforgettable and filled with impressive sights! Discover the quiet and charming capital Vientian known as "Moon Gate"
Visit sublime temples in LuangPrabang listed as UNESCO World Heritage Sites. Admire the wonderful waterfall Kuang Si, visit Pak Ou caves and go for a swim! Upon arrival at Wattay airport or the Friend ship Bridge, you are welcomed by your guide and taken to your hotel located in central Vientiane. 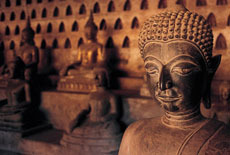 Situated on the bank of Mekong River, Vientiane is the charming and fascinating capital of Laos. This small town conjures up exotic images, with its curious mix of Laotian, Thai, Chinese, Vietnamese and French influences. 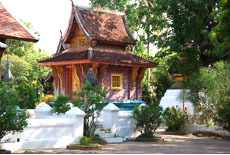 You will explore the town in the afternoon, starting with Wat Sisaket which is the oldest temple still standing in Vientiane. This amazing structure features remarkable frescoes and Buddha images. Next on the list is Haw Prakeo, the former royal temple of Laos’ monarchy, whichonce housed the famous Emerald Buddha Statue. You then visit the imposingPatuxay Monument, which is known as Vientiane's own Arc de Triumph before continuing to the famous That Luang Stupa. Overnight in Vientiane. The journeys northstarts at the city edge and weaves its way through stunning countryside towards the mountain region. Along the way you will visit the busy and colorful market of Thalat where various hill tribes come to trade their goods and buy previsions. 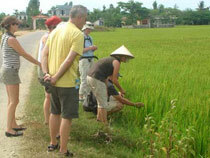 The next stop of your trip is Vang Xang, famous for an archeological site dating back to the 11th century. Continue toyour final destination, Vang Vieng nestled on a bend of the Nam Song River. The small and tranquil village of VangVieng has rapidly developed with a steady flow of tourists, coming to see the beautiful scenery.This mixture of tranquil water and limestone outcrops has remained unchanged for centuries. After checking into your hotel you will take a wander to catch your first glimpse of this hill town. Overnight in VangVieng. 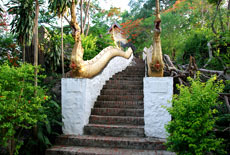 Heading out of town you will explore the famous cave of Tham Chang that once served as a hideout for locals from Chinese invaders. You will cross the river to Ban Huai Ngai, a very pleasant village where you can learn about different local traditions. Upon leaving VangVieng, the road begins to deteriorate, however the stunning mountain scenery makes for an interesting if bumpy journey. You will wind your way through Kasi and Phoukhoune to Luang Prabang. This town with its gleaming temple roofs, fading colonial architecture and stunning mountain backdrop has been declared by UNESCO as the best preserved traditional city in Southeast Asia. 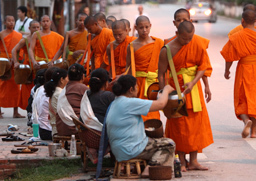 There is little traffic on Luang Prabang’s roads and monks in orange robes scurry in all directions carrying umbrellas to shield themselves from the eun. Overnight in Luang Prabang. Visit the former Royal Palace that has been turned into the National Museum . This interesting structure displays a lovely collection of artifacts reflecting the richness of Laotian culture dating from the days of the early kings right through to the last sovereign. You will also have time to explore some other landmarks of the city, including the impressive stupa of Wat Visoun, the shrine of Wat Aham, the city's oldest temple Wat Sene and WatMai’s five tiered roofs. After lunch you will drive 30km south to visit Kuang Si Waterfall, which, though not very high, is spectacular and exceptionally beautiful surrounded by its lush, green national park. Stop en route to visit Ban Na Oune, a small village of the Hmong hill tribe, probably the best-known minority group in Laos. Just before arriving at Kuang Si Waterfall, you will visit another village of the Khmu minority group, named Ban Tha Pane. There is plenty of time to relax and swim in the cool water, before you head back to Luang Prabang. A visit to LuangPrabang would be not complete without climbing the 329 steps to the top of Mount Phousi for a beautiful sunset view over the Mekong River. Overnight in Luang Prabang. 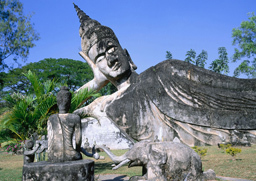 Today, you will continue your city tour, with a visit to the magnificent WatXieng Thong, which is nestled at the meeting point of the Mekong and the Nam Khan River . The temple’s structures are decorated in various ways with gilded stuccoes and doorways. A marvelous 'tree of life' mosaic pattern is featured on an outer wall. You then board a cruise upstream on the Mekong River, which gives you a taste of the tranquil countryside.Visit the mysterious Pak Ou Caves, crammed with thousands of gold lacquered Buddha statues of various shapes and sizes. Along the way, you will stop at Ban XangHai village to visit its rice wine distillery. 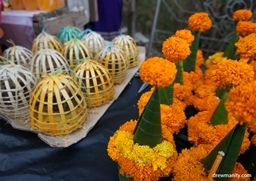 After disembarking, you will drive to the famous weaving village Ban Phanom where shoppers will happily bargain away. Overnight in LuangPrabang. After breakfast you are free to stroll around town before being taken to the airport for your departure flight. Asiatica Travel’s services end here.